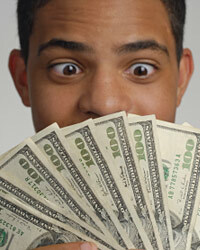 If you are in a financial bind, you may want to consider getting a cash advance on your inheritance. However, consider all your options before you go this route because the fees that you will pay in return for this advance are usually high. What is a cash advance inheritance? It is similar to a loan, except you are using an advance to an inheritance as collateral. Payment will be made once the inheritance finally makes its way through probate. You must prove that you are entitled to this inheritance through legal binding paperwork. A copy of the will is usually excellent proof. This cash advance inheritance may offer you a solution to pay your bills as you wait for your inheritance to work its way through probate. As most of us knows, a will can take anywhere from a few months to a few years to go through probate depending on just how complicated it is. What does the lending company get out of lending you this cash advance inheritance? They get guaranteed repayment of their money. They also get a sizable return interest rate on what you borrowed. This is how they make their money. Before you decide to go get a cash advance on your inheritance, you may first want to talk to your attorney. Researching Rates for a $500 Cash AdvanceWhat If You Get an Inheritance during Bankruptcy?Be Respectful of Your Inheritance: Tips for the WiseWhat Is Probate Inheritance?